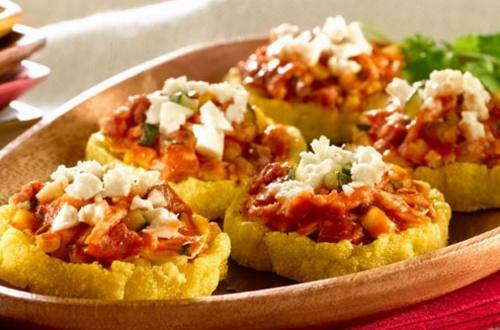 Bring this crowd-pleasing Chicken & Chorizo Sopes appetizer recipe to your next potluck and be the star of the night. Guests won’t be able to get enough of these tasty meat and veggie-filled snacks. 1 Combine masa harina, water and Knorr® Cilantro MiniCube; set aside. 2 In 12-inch nonstick skillet, cook corn until golden brown, about 8 minutes; remove corn and set aside. 3 In same skillet, heat olive oil and cook zucchini until tender, about 4 minutes. Stir in chorizo and cook until browned. Stir in corn and chicken; cook 2 minutes. Stir in sauce and bring to a boil. Reduce heat and simmer 5 minutes or until sauce thickens. Stir in cilantro; keep warm. 4 Roll masa mixture into 16 balls, then cover with plastic wrap. 5 Shape balls into 3-1/2-inch discs, a few at a time. In another skillet, heat a small amount of oil, if desired, and cook discs over medium heat 1 minute on each side. Remove from skillet; cool slightly. With fingers, pinch up edge of sope to make rim. Return to skillet and cook 2 minutes or until dough is firm and cooked through; keep warm. Repeat with remaining dough. 6 To serve, top sopes with Sauce mixture, then top with queso fresco. Garnish, if desired, with additional cilantro.